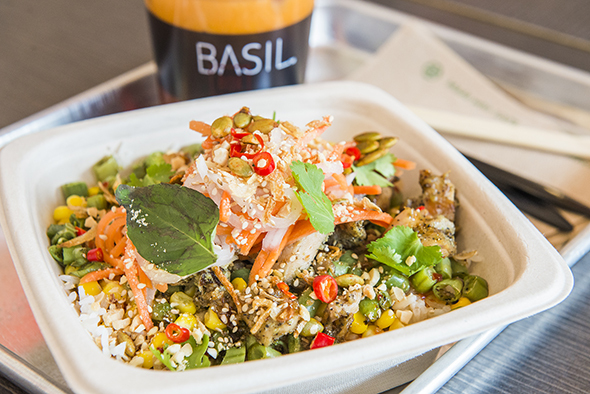 Basil Box on Yonge at the base of the Ryerson Student Learning Centre is a Southeast Asian eatery that's actually the second of its kind to open in the GTA (the first is in the food court at Square One). This location, however, is both standalone and sit-down with room for 80 diners. 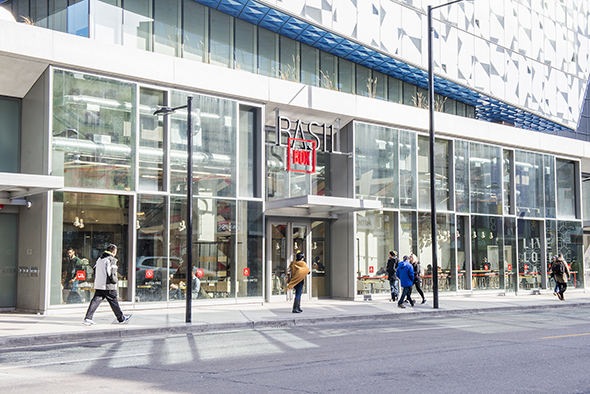 Owner Peter Chiu is a Ryerson alum, and the restaurant is designed with students in mind. The bright, casual space by Jump Branding & Design features ribbons of colour and natural textures like bamboo woven throughout while scenes from Asian street markets adorn the walls. Seating is a mix of high tops and tables. Ample electrical outlets have been enthusiastically embraced by the laptop-toting clientele. 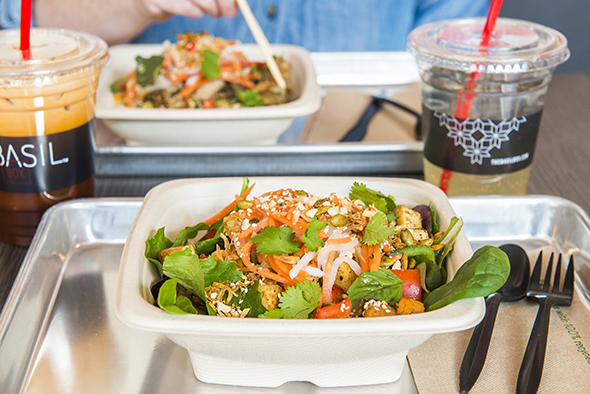 To order, we're ushered through a Chipotle-like assembly line to customize boxed meals, each priced at $9.45. 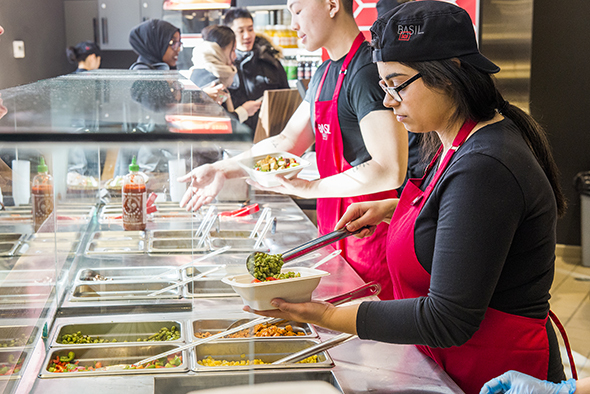 Ordering starts with a choice of salad, chilled rice noodles, brown rice or jasmine rice followed by a choice of two veggies, one protein, a sauce and then a selection of free toppings. I try the lemongrass chicken on jasmine rice and have it loaded with corn and green beans in sweet chili lime sauce. From the free toppings I add Sriracha spiced pepitas, pickled veggies, Thai chilis, and fresh herbs. The resulting creation is a vibrant box full of bold flavours, colours and textures. I particularly like the chicken, which is chopped into bite-size morsels but retains ample juiciness. 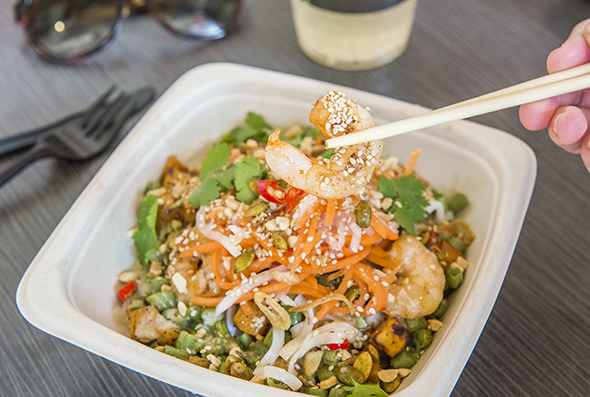 When it comes to the box of chili lime shrimp on noodles, I'm most impressed by the noodles. Served cold, the vermicelli stays slippery rather than sticky. On a bed of spring mix, I sample the vegan option: a coconut curry tofu, this time dressed in a tangy tamarind sauce (all the sauces are vegan). Charred sweet potato and sautĂŠed peppers bulk up this salad while pickled veggies, crushed peanuts and sesame seeds add a crunchy element. The disposable dishes and cutlery are all biodegrade. The bowls are made from bagasse (sugar cane fibre) and utensils are made of plant starch. There's a cold case full of drinks and grab and go items too. 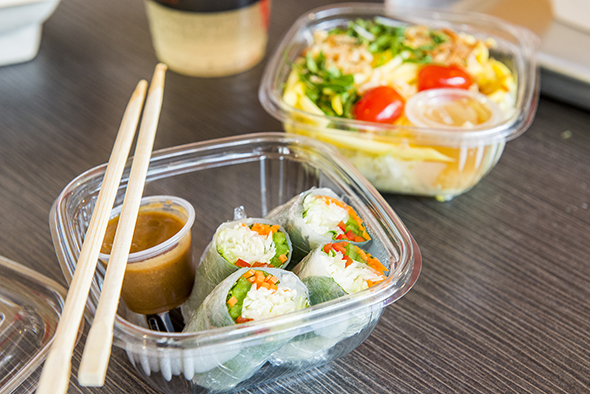 A mango salad ($3.25) and veggie fresh rolls with peanut sauce ($3.25) are welcome side dishes. 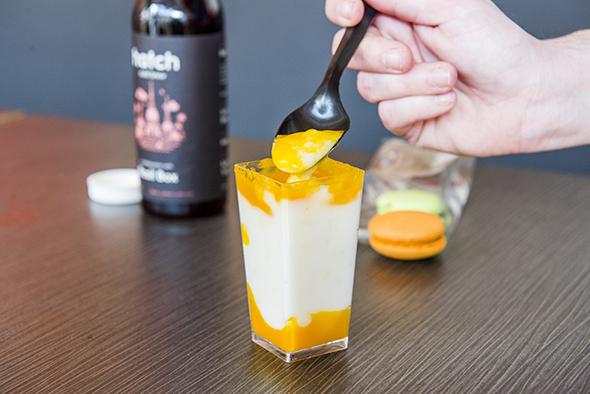 A selection of snacks includes a sweet mango rice pudding ($2.50), Chiang Mai trail mix ($2.50), and Thai tea and ginger lime macarons ($5.25). 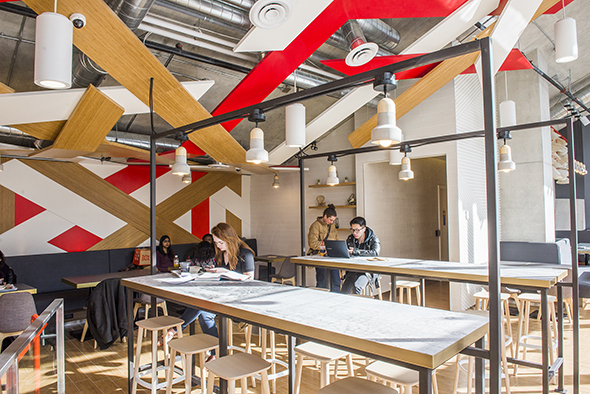 This fast food concept skips the usual soda options. 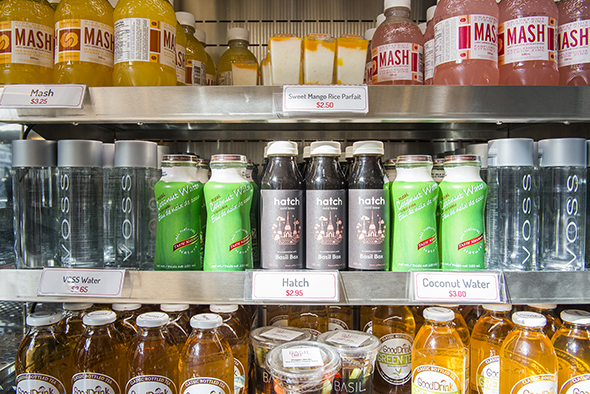 Hand Crafted Refreshers ($3.25) in flavours like Thai iced tea and mango ginger ale are sweetened with cane sugar while the cooler is stocked with bottles of Boylans ($2.65), bottled iced teas ($2.95), and coconut water ($3). Those in need of a caffeine fix can opt for the custom cold brew coffee ($2.95). 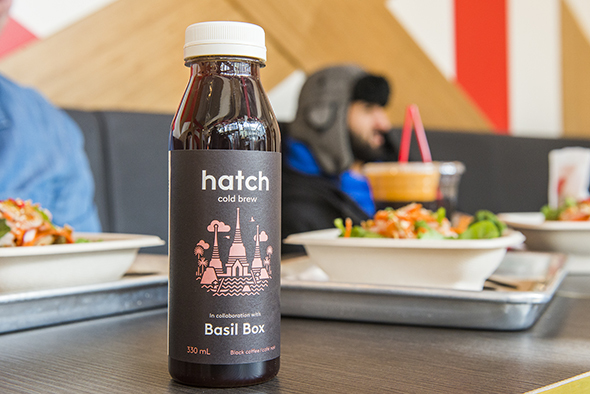 Produced in collaboration with Hatch , the bottled bevy features a single origin brew from Southeast Asian beans.